Spectra of the two new bright z ∼ 5 quasars, J013539-212628 at z = 4.94 (upper panel) and J093032-221208 at z = 4.86 (lower panel). The red lines mark the expected positions of Lyα (left) and CIV (right). Credit: Li et al., 2018. Powered by the most massive black holes, bright quasars at high redshift are important for astronomers as they are perceived as the brightest beacons highlighting the chemical evolution of the universe most effectively. However, such objects are extremely rare and difficult to find. So far, fewer than a dozen quasars have been discovered at redshift over 4.5 and magnitude in the i-band below 18.2. "Finding them requires large surveys, and so it is no surprise that the first z > 5 quasars were found in the large-area Sloan Digital Sky Survey. (…) Bright z > 4.5 quasars are difficult to find because of their intrinsic rareness and severe contamination by cool stars with broadly similar colors," the paper reads. Recently, a team of astronomers led by Zefeng Li of the Australian National University (ANU) conducted a search for bright, high-redshift quasars. They used the ANU 2.3m-telescope at Siding Spring Observatory in Australia equipped with the Wide Field Spectrograph (WiFeS) to perform follow-up observations of objects first spotted by the SkyMapper Southern Survey, Pan-STARRS1 telescope and NASA's Wide-field Infrared Survey Explorer (WISE) spacecraft. The observational campaign, which resulted in the discovery of two new bright quasi-stellar objects at high-redshift, was carried out between December 2017 and April 2018. "This paper presents our first step in searching for bright, high-redshift QSOs in the southern sky and reports the discovery of two new bright i ~ 18 quasars at z ~ 5," the astronomers wrote in the paper. The newly discovered quasars, designated SMSS J013539.27-212628.4 and SMSS J093032.58-221207.7, were found at redshifts of 4.94 and 4.86 respectively. SMSS J013539.27-212628.4 has a magnitude in the i-band of 18.0 while this value for SMSS J093032.58-221207.7 is 18.11. The two new QSOs therefore comprise an important addition to the currently short list of known quasars at a redshift higher than 4.5 with a magnitude below 18.2. Additionally, observations conducted by Li's team rediscovered two other bright, high-redshift quasars identified by previous studies. Other object investigated by the team turned out to be cool stars. The researchers noted that the second step in searching for bright, high-redshift quasars could be made when more data surveys like SkyMapper are available. The added that the SkyMapper DR2 (Data Release 2) scheduled for August 2018 will be helpful in this search. DR2 is expected to provide deep photometry in all bands across the Southern declination range. However, full coverage of the sky at full depth will only be achieved when the observations are completed in 2020. We present a search for bright z∼5 quasars using imaging data from SkyMapper Southern Survey, Pan-STARRS1 and the Wide-field Infrared Survey Explorer (WISE). We select two sets of candidates using WISE with optical bands from SkyMapper and alternatively from Pan-STARRS1, limited to a magnitude of i<18.2. 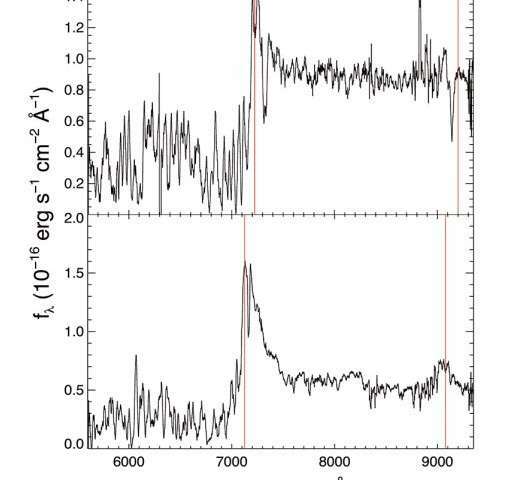 We follow up several candidates with spectroscopy and find that the four candidates common to both lists are quasars, while others turned out to be cool stars. Two of the four quasars, SMSS J013539.27-212628.4 at z=4.86 and SMSS J093032.58-221207.7 at z=4.94, are new discoveries and ranked among the dozen brightest known z>4.5 QSOs in the i-band.